Ever seen or heard of a rain barrel? If not, now is your chance. With spring rains on the way, it’s time to think about rainwater harvesting. “Rainwater harvesting” is the capture of precipitation for beneficial reuse before it seeps into the ground or is conveyed away by storm drains. The collected water may be used for livestock, irrigation, outdoor washing, or gardening. Since 2010, rainwater harvesting is legal in Utah and is gaining popularity as a way to mitigate storm runoff, reduce municipal water use, and conserve natural resources. It is one example of low-impact development (LID), along with rain gardens, green roofs, bioswales, and permeable pavements. In residential settings, roofs are the best collection surfaces. Water on roads and driveways is quickly contaminated by sediment, oils, metals, and fertilizers. 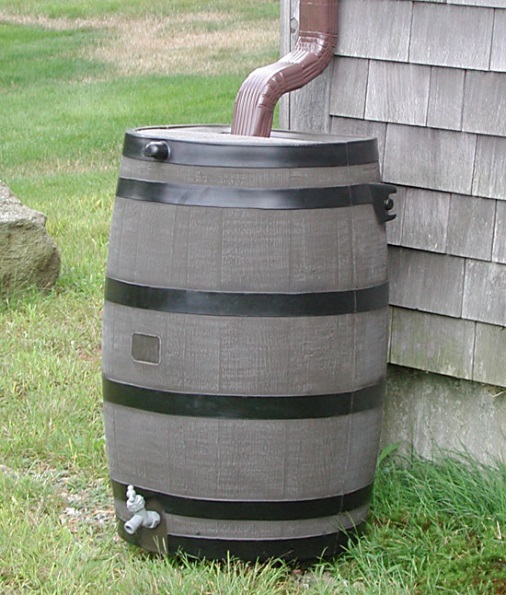 A typical harvesting setup involves placing a rain barrel under a downspout. (More elaborate systems exist, but most users are content with the barrel.) A spigot at the bottom of the barrel allows one to connect a hose or fill a watering can. A variety of manufactured rain barrels are available from several retailers. While not fit for drinking, rainwater collected from a roof is suitable for yard application. Rainwater can also be collected from commercial and industrial sites. Rainwater harvesting has numerous benefits to users and to the environment. Outdoor use of harvested rainwater, when available, reduces consumption of treated municipal water that is better suited for indoor purposes. This is especially beneficial during summer months, where much of the water demand is due to yard irrigation. Rainwater collection also helps attenuate peak storm runoff that could contribute to flooding, erosion, and pollution. Low cost, distributability, and versatility have made rainwater harvesting a popular solution. Harvesting rainwater in Utah once required a water right. In 2010, Senate Bill 32 simplified the process. Two regulatory options now exist: unregistered and registered. Unregistered harvesting is limited to two containers with storage up to 100 gallons each (barrel size). This is ideal for occasional yard use. Storing larger amounts requires free online registration through the Utah Division of Water Rights. Registered harvesting allows a person to collect up to 2,500 gallons of precipitation (usually in an underground storage tank). In either case, collection, storage, and beneficial use must occur on the same property owned or leased by the user. For more information about harvesting rainwater in Utah, visit the registration page or review the state regulations.